In food processor bowl, place chickpeas, egg, garlic, smoked paprika, coriander, cumin and salt. Cover; process with on-and-off pulses about 45 seconds or until nearly smooth. Stir together bean mixture, spinach, carrot and cilantro until well combined. Stir in bread crumbs. Shape mixture into 4 patties, about 3 1/2 inches in diameter and 1/2 inch thick. In 10-inch nonstick skillet, heat 2 tablespoons canola oil over medium heat until hot. Cook patties in oil 8 to 10 minutes, turning once, until brown and crisp. 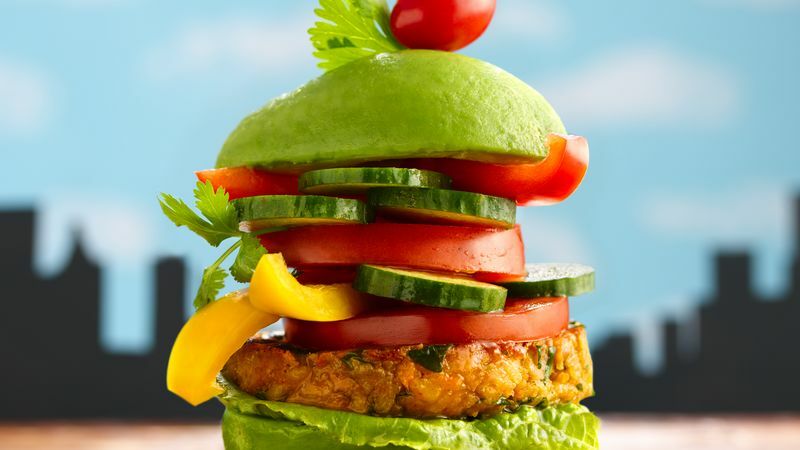 Serve veggie burgers stacked with toppings and drizzled with sauce. Heat gas or charcoal grill. Spray sheet of heavy-duty foil. Place patties on foil. Place on grill over medium-high heat. Cover grill; cook 8 to 10 minutes, turning once, until brown and crisp. We think these veggie burgers are so good, they don't need a bun. Try them stacked with fresh veggies and a drizzle of your favorite burger sauce. Or, top with a fresh veggie salsa. To make fresh veggie salsa, in a medium bowl, mix 1 cup coarsely chopped red or yellow bell pepper, 1/2 cup thinly sliced cucumber, 1/4 cup slivered white onion and 1/4 cup cilantro leaves. Stir in 1 tablespoon fresh lime juice, 1 tablespoon olive oil and salt and pepper to taste. About 2 cups salsa.